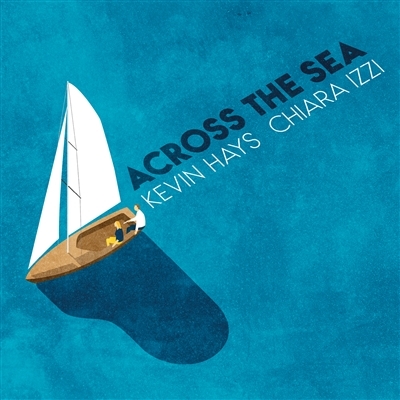 In 2019 Jando Music/Via Veneto Jazz will release Across the sea of Kevin Hays and Chiara Izzi. This album is the outcome of an encounter of two musicians so distant and yet so inexorably close. A project where the music is always tangible, not volatile, particularly when born under a bright inspirational sky. Those holding the reins of this visionary journey between jazz and pop, America and Italy, dream and lyricism are, without doubt, the two artists: Chiara, with her warm, mediterranean voice and Kevin, one of the most celebrated and admired pianists and composers on the american jazz scene which can boast pop music distinguished collaborations (James Taylor). Across the Sea is recorded at the legendary Sear Sound in New York; the outcome of diligent project work, with the collaboration of several guests such as Omer Avital, Gregoire Maret, Nir Felder, Chris Potter and Rogério Boccato that simply amplify the awareness that this shared journey, so rich and adventurous, began under the best auspices. The compelling predominance of melody, the osmosis between vocals and keyboards and the amazing confluence of their singing voices, have sublimated the tasks related to production into subtle finishing touches of a chisel, aromas, invitations and "further" sounds magically converging into the final work. The French horn in the emblematic Two for the Road, the ancestral oud in the classic Miles Davis’ Nardis, the punctual and decisive harmonica in Pat Metheny’s James, the caressing guitar in Circles of the Mind, the sinuous saxophone in Viaggio Elegiaco, are just a few examples. The world premiere of Across the Sea will take place on February 28, 2019 in a jazz temple: the Birdland of New York City. Award winning Italian singer, songwriter Chiara Izzi has been described by Jazz Times as “a talent to be heard, admired and anticipated” after the release of her debut album “Motifs”. She started her musical path in Italy by learning to play the piano and performing very early. She developed a versatility thanks to a multitude of performances in Italy and abroad in Belgium, Switzerland, France, the United States, Finland and Germany, which led to her vocal mastery of traditional jazz alongside contemporary styles. Chiara’s sound is based on her own unique interpretation of a fusion of different genres, including jazz, pop and Mediterranean sounds. Chiara’s International debut took place at the Montreux Jazz Festival Vocal Competition in 2011, where she was awarded first prize by the living musical legend Quincy Jones. Following this award the vocalist was invited to open for Paco de Lucìa’s concert at the Montreux Jazz Festival in 2012. Thanks to this award she had also the chance to record her debut album “Motifs” released by the New York based label Dot Time Records. The record has been presented in some well-known radio programs in Belgium, Holland, Italy and received notable reviews in the US on Jazz Times, All About Jazz, AXS, Midwest Record, to name of few. She is currently living in New York and performs regularly around the city. Some of her notable performances occurred in prominent jazz venues such as The Blue Note NY, The Iridium, Sarasota Jazz Festival, Apollo Theater, Aspen Jazz Festival, Jazzahead, Smalls, Italian Embassy in Washington DC. She’s also graced the stage with some of the finest musicians, including Kevin Hays, Leon Parker, Jeff Hamilton, Aaron Goldberg, Bruce Barth, Eliot Zigmund, Warren Wolf, Anthony Wonsey, among many others. Chiara graduated with honors with a Master's Degree in Jazz Music in Italy and she has caught the attention of and received remarkable appraisals from Quincy Jones, Bobby Watson, Benny Golson, Kevin Hays, Eliot Zigmund, Joel Frahm, Aaron Goldberg, David Kikosky, Greg Hutchinson, Jonathan Kreisberg, Dado Moroni and many others.